There were some discussions this morning on twitter regarding the configuration of EVC for a vSphere Cluster using one of the vSphere CLI's such as PowerCLI or directly leveraging the vSphere API. Unfortunately, this is not possible today as the operations pertaining to EVC are not currently exposed in the vSphere API. This means you will not be able to use the vCLI, PowerCLI, vCO or the vSphere API to configure and manage EVC configurations, you will need to use the vSphere Client to do so. Having said that, one could still "potentially" automate EVC configurations using the vSphere MOB interface using the private vSphere API, but it may not be ideal and will require some "creativity" and custom coding to integrate with your existing automation solution. This particular limitation of the vSphere API is one that I have personally faced and have filed a bug with VMware awhile back. I am hoping this will eventually be added to the public vSphere API, so that users can fully automate all aspects and configurations of a vSphere Cluster. Disclaimer: This is not officially supported by VMware, use at your own risk and discretion. Step 1 - Connect to your vCenter MOB and traverse to the vSphere Cluster of interest (note the MOID will be different in your specific cluster). 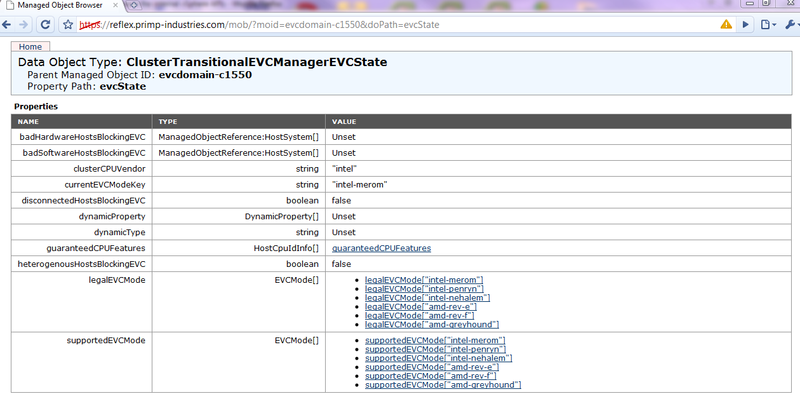 and hit enter and you'll be brought to TransitionalEVCManager() method, you'll then want to click on the "Invoke Method". Once you do so, you should be returned with a task object and you'll have a link to something like evcdomain-cXXXX. Click on this and you'll be brought to ClusterTransitionalEVCManager. Note: If EVC is already configured in your vSphere Cluster, you can use the vSphere API to view it's current configuration by looking at the ClusterComputeResource's summary property. You just will not be able to make any changes or disabling EVC using the vSphere API. So I tried this and was able to replicate it… now about the automating it, have you tried anything? I cannot seem to with just a simple curl statement… Just getting cross site scripting warnings.